Pope Leo I, or Leo the Great, was pope of the Roman Catholic Church from September 29, 440 to November 10, 461. He was a Roman aristocrat and the first Pope of the Roman Catholic Church to whom the title "the Great" was attached. He is perhaps best known for having met Attila the Hun outside Rome in 452, in an attempt to persuade the king not to sack the city. Since Attila withdrew his attack, Leo has traditionally been credited with saving Rome. He was made a Doctor of the Church in 1754. A leading figure in the centralization of the organization of the Roman Catholic Church, he was probably the first pope to advocate the supremacy of the see of Rome. As the Roman Empire fell apart, he positioned the papacy to emerge as the dominant authority. His papacy was a time of Christological debate and his own doctrinal formulation carried the day at the Council of Chalcedon (451). He laid the foundations on which a future Leo, Leo III, created the Holy Roman Empire, asserting papal temporal, as well as spiritual, power. Leo was a native of Tuscany. He appears to have taken orders at an early age, since by 431, he was a deacon under Pope Celestine I, occupying a sufficiently important position within the Roman curia (probably as an archdeacon) for Cyril of Alexandria to apply to him to oppose Juvenal of Jerusalem’s claim to patriarchal jurisdiction over Palestine—unless this letter was addressed to Pope Celestine I. At about the same time, John Cassian of Gaul wrote a treatise against Nestorius, which he dedicated to Leo. This shows that Leo was known outside of Rome. He was also asked by the Emperor, Emperor Valentinian III, to settle a dispute between Aëtius and Albinus, the two highest officials in Gaul. During his absence on this mission, Pope Sixtus III died (August 11, 440), and Leo was unanimously elected to succeed him. He became Pope on September 29. His pontificate proved to be epoch-making for the centralization of the government of the Roman Catholic Church. This period of Church history was a battle ground between various versions of Christian truth. Discovering that followers of Pelagius, whose teaching had been condemned, were being received into communion in the diocese of Aquileia without formal repudiation of what the Catholic Church considered to be errors, Leo wrote to rebuke this practice. He required a solemn abjuration before a synod. He also condemned the Manicheans who had reached Rome in 439, fleeing from the Vandals, and had secretly organized there. When he learned of their presence in Rome around 443, Leo held a public debate with their representatives, burnt their books, and warned the Roman Christians against them. In 444, he wrote to the Bishops against the Manicheans, and in 445, the Emperor issued, at his request, a decree banishing them. In Spain, the Priscillianists’s popularity was increasing. Priscillian of Ávila (died 383) was the first Christian to be executed for heresy. He taught extreme asceticism, including the repudiation of marriage for all believers. Leo wrote an extended treatise (July 21, 447) against the Priscillianists, examining their teachings in detail, and repudiating them. He called for a Spanish general council to investigate whether there were any supporters in the episcopate—but this was prevented by political instability in Spain. Leo anathematized Nestorius “for separating the nature of the Word and of the flesh in the blessed Virgin's conception, for dividing the one Christ into two, and for wishing to distinguish between the person of the Godhead and the person of the Manhood." Leo also introduced the practice of "secret confession” instead of public confession, in a bid to give priests greater authority. The authority of the Bishop of Rome over, and within, other diocese was still developing at this time and was by no means universally acknowledged. The Bishop of Rome was regarded as primus inter pares, first among equals, not as the final and highest authority. By intervening in ecclesiastical jurisdictions outside Rome, Leo was positioning himself and his successors as the senior Primate, or Patriarch. The Patriarch of Constantinople, among others, was unhappy with this claim, regarding his City as the new Rome with the better claim to be capital of the Christian world. Leo became involved in a dispute concerning the Bishop Hilary of Arles in Gaul, who claimed the right at Primus to consecrate all bishops in Gaul and to discipline them without reference to their metropolitan bishops. After Hilary dismissed Bishop Celidonius of Besançon for allegedly having married a widow while still a laymen, Celidonius appealed to Leo to intervene. Hilary refused to acknowledge Leo’s right of jurisdiction, and was summoned to a synod in Rome. There, he defended his actions but Celidonius was reinstated and the right of all bishops to appeal to Rome was upheld. Hilary’s own jurisdiction was limited to his immediate diocese. In 445, Leo had another chance to enforce his authority in another diocese. This time, it involved the patriarchate of Alexandria. He insisted that the ecclesiastical practice of this see should follow Rome’s; since Mark, the disciple of Peter was the founder of the Alexandrian Church, he argued, it could have had no other tradition than that of the prince of the apostles. In a letter to the bishops of Campania, Picenum, and Tuscany (443) he required the observance of all his precepts and those of his predecessors; and he sharply rebuked the bishops of Sicily (447) for deviating from Roman custom as to the time of baptism, requiring them to send delegates to the Roman synod to learn the proper practice. Leo clashed also with the Patriarch of Constantinople over whose jurisdiction covered Illyria, where the bishops showed a tendency to side with Constantinople. In 444, Leo l stipulated in a letter to the Illyrian bishops the principle that Peter had received: Jesus had entrusted Peter with primacy oversight of the whole Church, and that therefore all important matters were to be referred to and decided by his successors, the bishops of Rome. In 446, he twice intervened in the affairs of Illyria, and in the same spirit spoke of the Roman pontiff as the apex of the hierarchy of bishops, metropolitans, and primates. After Leo’s death, however, Illyria again looked to Constantinople. 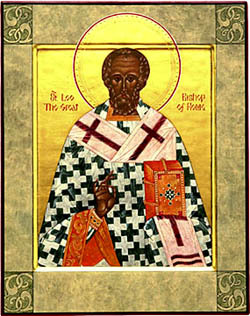 Both in dealing with the Manicheans, and with the rebellious Bishop of Arles, Leo did not hesitate to use the secular or civil authorities to support his authority. In June 6, 445, he obtained from the Emperor the famous decree which recognized the primacy of the bishop of Rome based on the merits of Peter, the dignity of the city, and the Nicene Creed. The decree ordered that any opposition to his rulings, which were to have the force of law, should be treated as treason and provided for the forcible extradition by provincial governors of anyone who refused to answer a summons to Rome. The dominant theological issue under debate was the questions of how Jesus’ human and divine nature is related, or whether he had one or two natures. When Eutyches of Constantinople was excommunicated by the Patriarch of Constantinople for teaching that Jesus had a single, divine nature into which his human nature was absorbed, he appealed to Leo. Leo replied in his Tome (449), upholding the doctrine of two distinct, unconfused natures. The approaching collapse of the Western Empire gave Leo a further opportunity to appear as the representative of lawful authority. 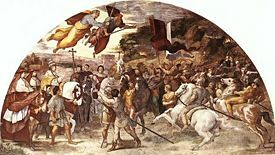 When Attila invaded Italy in 452, and threatened Rome, it was Leo who, with two high civil functionaries, went to meet him, and effected his withdrawal. According to Prosper of Aquitaine, Attila was so impressed by him that he withdrew. Jordanes, who represents Leo's contemporary, Priscus, gives other grounds. Pragmatic concerns such as the large sum of gold that accompanied Leo, or logistical and strategic concerns, may have been the true reason for Attila's mercy. Attila's army was already quite stretched and had a lot of plunder, so the Pope's plea for mercy may well have merely served as an honorable reason for not continuing with the sack of the Roman capitol. Other, hagiographical sources cite that a man dressed in priestly robes and armed with a sword was seen by Attila during his discourse with Pope Leo, and prompted Attila to submit to the Pope's request. Unfortunately, Leo's intercession could not prevent the sack of the city by the Vandals in 455, but murder and arson were repressed by his influence. He died on November 10, 461, according to tradition. The significance of Leo's pontificate lies in his assertion of the universal episcopate of the Roman bishop, which he set out in his letters, and in his ninety-six extant orations. This is commonly referred to as the doctrine of Petrine supremacy. According to Leo, the Church is built upon Peter, in pursuance of the promise of Matthew 16:16-19, Peter participates in everything which is Christ's; what the other apostles have in common with him they have through him. The Lord prays for Peter alone when danger threatens all the apostles, because his firmness will strengthen the other apostles. What is true of Peter is true also of his successors. Every other bishop is charged with the care of his own special flock, the Roman with that of the whole Church. Other bishops are his assistants in this great task. Through the see of Peter, Rome had become the capital of the world in a wider sense than before. For this reason, when the earth was divided among the apostles, Rome was reserved to Peter so that there, at the very center, the decisive triumph might be won over by the earthly wisdom of philosophy and the power of the demons. Thus, from the head, the light of truth streams out through the whole body. In Leo's eyes, the decrees of the Council of Chalcedon acquired their validity from his own confirmation of them, not from unanimity. Chalcedon established what became orthodox dogma in the West but failed to reconcile genuine differences of opinion on the issue of Jesus’ nature as human and divine. The Roman Catholic and many Anglican churches mark November 10 as the feast day of Saint Leo (formerly April 11), while the Eastern Orthodox churches mark February 18 as his feast day. ↑ Rev. Charles Lett Feltoe, trans., Writings of Leo the Great. Letters and Sermons (New York: Philip Schaff, Christian Literature Publishing Co, 1886). ↑ The Crossroads Initiative, The Tome of Syt. Leo the Great. Retrieved October 10, 2007. ↑ New Advent, Council of Chalcedon. Retrieved October 10, 2007. ↑ Fordham University, Medieval Sourcebook: Leo I and Attila. Retrieved October 10, 2007. ↑ Patron Saints Index, Leo the Great. Retrieved October 10, 2007. This page was last modified on 25 June 2018, at 21:47.